What kind of Comanche was that? Ever get confused to what years had what packages, and what they looked like? I used to, until I researched models, learned more, and spent some time around the real deals. Since I know some of you don't have as much time as me, here is my compiled findings. A * Denotes that the package continued, just under a new Graphic/Apperarance. 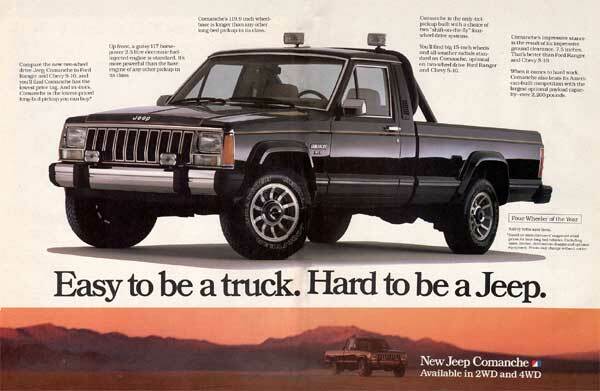 Made from 1986 to 1992 the base model could be the bare bones stock model, or could be ordered with every option, except those set aside for other packages. The base models are easy to spot, with the bare outside, having no decals, or badges to say it is anything else. 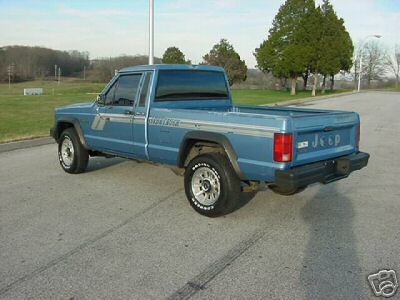 Made in 1986 only, the Comanche X was a step up from the Base models. It offered things that weren't standard on a base, and wasn't as decked out as the XLS. The X was identified by the "X" Badge underneath the Comanche emblem. 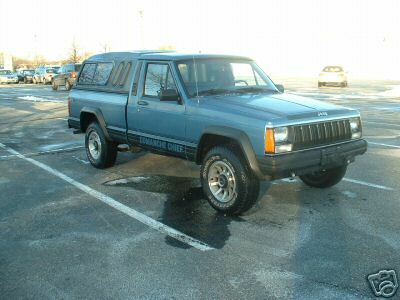 Made only in 1986, the Comanche XLS was the top of the line model, with many options standard. It included options like the 2.8L V-6 or the Turbo-Diesel, and power amentities. It is recognizeable by the "XLS" Emblem underneath the Comanche Badging. These often had gold pinstripes all over the hood, and along the body creases, and could be two-toned. 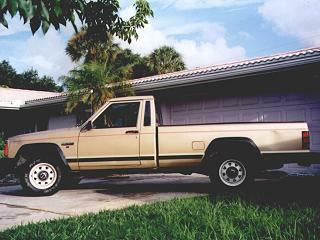 Made from 1987 to 1989 the Laredo was a basic model, with a two tone exterior paint package. Again, a step up from the base and SporTruck, it included standared things that the lower models didn't. Recognizeable by the two-tone paint, and a "Laredo" Emblem underneath the "Comanche" emblem. Made from 1987-1989 in short bed models only, The Chief was the off-road model. 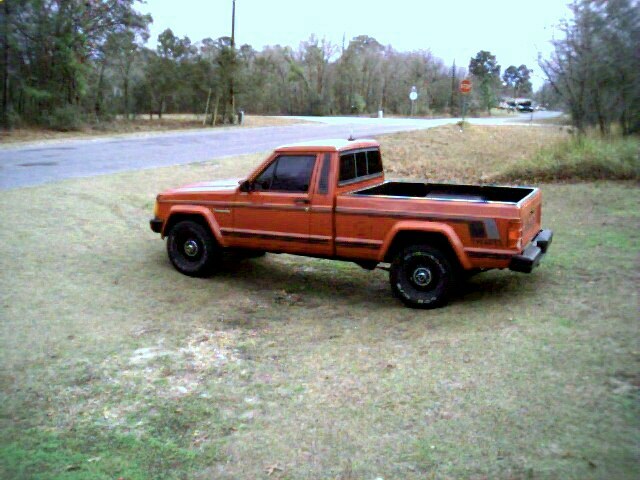 It is easily spotted by the black striping under the lower body crease, having a large "Comanche Chief" in the striping under the cab and lower bed. Made from 1987 to 1990, the first version of the Pioneer was the off-road model. It was a step up from Base and SporTruck, yet a step down from the popular Eliminator. It came standard with things like an AM/FM stereo, and power steering. It is easily spotted by the pinstripes down the side of the truck turning into a flare behind the rear fenderwell, with the word "Pioneer" under the flare. A Pioneer could also run decal-less, and just have a simple "Pioneer" badge under the "Comanche" emblem. 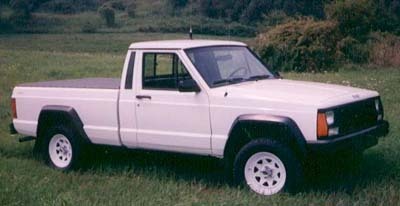 Made from 1987 to 1990, the first models of the SporTruck were a step up from the Base model, and had few standard options. It was recognizeable by the striping, starting as a flare on the door, ans sweeping back to the tail lights. There was a "SporTruck" in the stripe on the fron thalf of the bed.